I popped by the farmers market today to pick up some squash blossoms, peaches and freshly baked bread. I somehow had missed that Jaleo Tapas Bar was making a mega paella today. If you're nearby, hurry over. It's delicious and features what's in the market today, from squash blossoms to snap peas and patty pan squash. 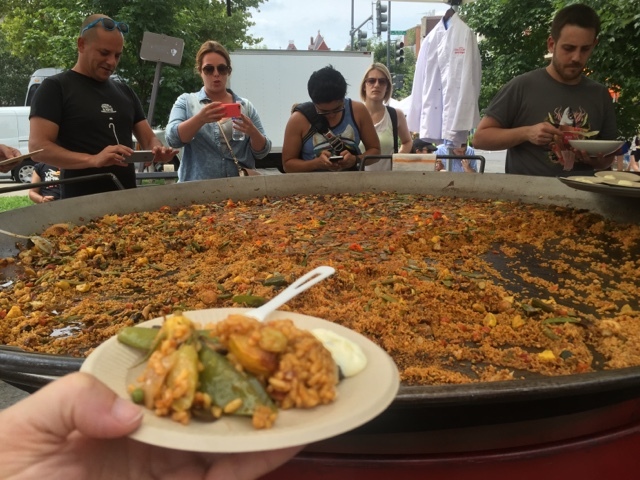 The Dupont Circle Farmers Market is open until 1pm and the paella is in the little park at Q Street and Connecticut Avenue NW.